How to Thicken Thin Hair Naturally? HomeBoldbarber hair adviceHow to Thicken Thin Hair Naturally? It is not a secret, that stress, aging, genetics and chemicals in hair treatments and dyes are causing thin hair. Another factors which cause thin hair are harmful shampoos, cooper deficiency, manganese deficiency, hypothyroidism, vitamin D deficiency, as well as hormonal imbalance. No matter why your hair is thin, if you long for think and voluminous hair, follow the strategies which can help you to get thicker and fuller hair. 1. Choose only chemical-free hair care products, because nowadays most of hair products such as shampoos, conditioners and styling products contain chemicals which wear down the hair, dry it out and make it brittle, thereby causing hair breakage and hair loss. Get rid of shampoos which contain sulfates, replace commercial conditioners with natural and self-made masks which are made of ingredients such as coconut oil, aloe or apple cider vinegar. Throw out all hair styling products which contain a lot of chemicals or try to use them as rarely, as possible. 2. It may seem weird, but certain hair-handling habits can cause hair fray, break off or fall out, because hair is soft and fragile, therefore, handle your hair gently and try not to treat it too roughly. 3. Wash your hair less frequently, because too frequent washing does not give the scalp time to produce its natural oils which coats the hair and keeps it healthy. It is recommended to wash them three times a week. If you need more frequent washing use dry shampoos to refresh your hair between washings. 4. Instead of wringing out and rough toweling, use a soft towel to gently squeeze your hair and blot them dry. 5. Instead of brush use a wide-toothed comb to brush your hair and never brush your hair when they are wet. 6. Do not use heat, because all styling tools like hair dryers, straightening and curling irons damages hair. Considering this fact, use them as rarely, as possible or get rid of them. 7. Let your hair be natural, because actions such as bleaching and coloring makes your hair dry and brittle, causing hair breakage and loss. Also permanent curls and chemical straighteners are extremely damaging to your hair. 8. Regularly cut your hair. Hair cutting helps to get rid of dull and damaged ends, as well as adds volume and health to your hair. Shorter and layered cuts make your hair look thicker. 9. Eat food which is rich with different and useful nutrients. When your diet is balanced and wholesome, it shows in the texture and volume of your hair, because thickness and volume of hair directly depends on a healthy diet, repleted with vitamins and minerals which promote the hair growth. 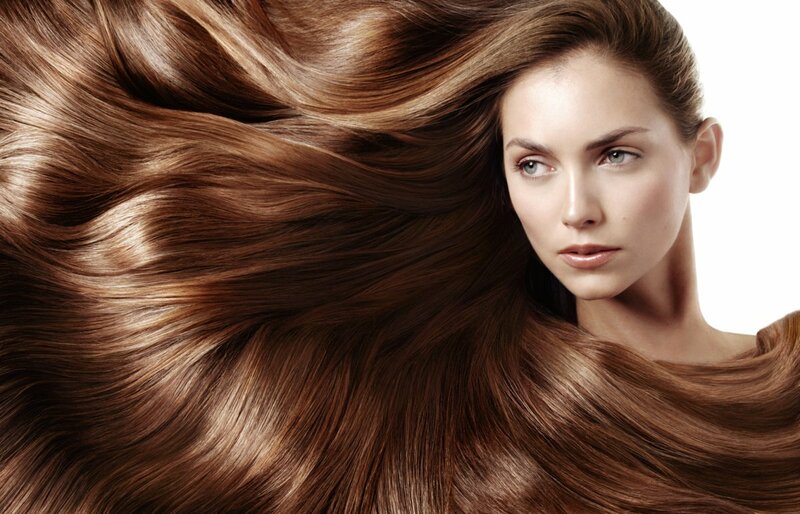 It is important to get plenty of protein which is responsible for thick and shiny hair. Great sources of protein are fish, lean meat, nuts and eggs. Do not forget about taking of omega-3 fatty acids, because these elements improve the hair growth. You can find omega-3 fatty acids in sardines, walnuts, avocados, as well as in pumpkin seeds. Also vitamin C is important for healthy hair, therefore, eat spinach and other leafy greens to get this vitamin. 10. Protect your hair from environmental damage, because your everyday activities may cause your hair to become thinner and brittler as well. Keep your hair out of the sun, because direct sunlight damages your hair like it damages your skin. Also pollution damages your hair – pollution from different vehicles dries your hair out. If you are a lover of swimming pools, be careful, because chlorine which is found in swimming pools damages, dries and thins your hair. 11. If it is possible, remove the stress from your life or just try to relieve it. Everyday stress and other psychic factors usually manifests in hair loss. Try to deal with the stress, using different healthy methods like meditation, exercises and enough sleep. 12. Try different hair thickening products. Your can try those which are found in beauty stores, for example, special shampoos, conditioners, serums, balms, masks and other products which are intended for hair growth. Do not forget about home remedies which can be very helpful for your hair thickening, for example, castor oil, onion juice, orange juice, ginseng, grapeseed essential oil, cedarwood essential oil, eggs, olive oil, avocado, fenugreek seeds, Indian gooseberry, aloe vera, henna leaves and flaxseed. Apply these ingredients on your hair like conditioner or mask regularly and see results soon! If you want to get a thick hair instantly, wash your hair with baking soda or apple cider vinegar. 13. Massage your scalp with special brushes, massage tools or your fingers daily. It is important to massage the scalp for about 5 minutes and, ideally, two times a day, for example, in the morning and in the evening. Massaging increases blood flow and promotes circulation to stimulate the hair growth. 14. If none of these methods are suitable for you, you can get extensions, weaves or clip-ins. Nowadays these aids are natural and effective option for getting thicker hair immediately. 15. Another immediate method of getting thicker hair is getting hair transplants. In this procedure individual hair follicles are surgically implanted in areas of head which are thinning or balding. It should be mentioned, that this method is quite expensive, but it is effective and long-lasting.